Most of the VLSI engineers are aware of DRC and appreciate the need for a DRC cleaned database. This paper will give a brief idea about the different types of DRC violations, the reasons for their occurrence in the physical design, and the heuristic approach to fix it. We will also look at the Design Rule Checks proposed by the foundries (for example: TSMC, Intel, Samsung, etc.) and explore how they are targeted for the specific technology node (e.g. 28nm,16nm, 7nm). 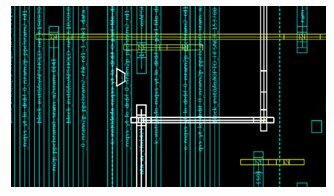 The main objective of the Design Rule Check is to achieve reliability in the design and to improve the gross yield of the die. All the rules, provided by the foundry, are fed as an input to the Physical Verification Tool in the form of verification rule file (Rule deck file for Physical Verification Tool). If any of the rules are violated, the DRC will be reflected in the design. The DRCs are broadly classified as the Base Layer DRC and the Metal Layer DRC. The below figure depicts this classification. 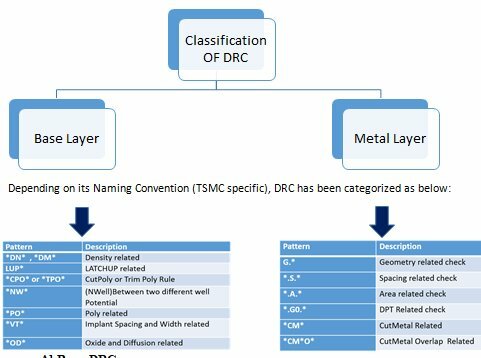 The DRCs – which are associated with FEOL (Front End of Line) Process include Nwell, N+, P+ implant layers, poly, Oxide Diffusion, etc. – are referred to as Base Layer DRC. The fixation of these DRCs demands the alteration of FEOL layers. 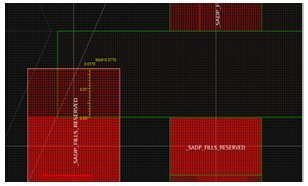 The general practice followed by physical designers is to fix these violations before the floorplan gets frozen or before the sign-off phase of the design cycle. In the course of time, as the technology gets updated, the APR flow is developed to address the Base DRC in an augmentative way in order to avoid hitches in subsequent PnR/Sign Off stages of the physical design flow. Some of the DRCs can vary depending on DFM (Design for Manufacturability) practices followed by the different foundries. 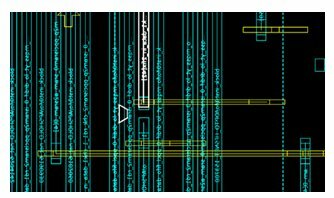 The DRC associated with the BEOL (Back End of Line) Process are those that include interconnects or metal layers which are plugged with FEOL and external devices. 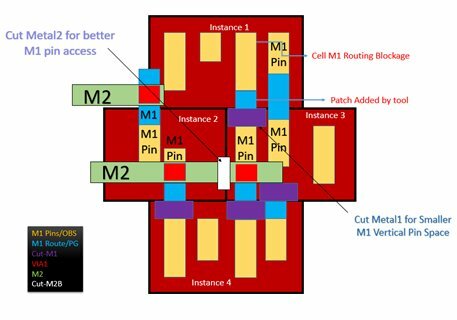 The Cut Metal/Trim Metal DRCs are newly introduced in 7nm technology node. 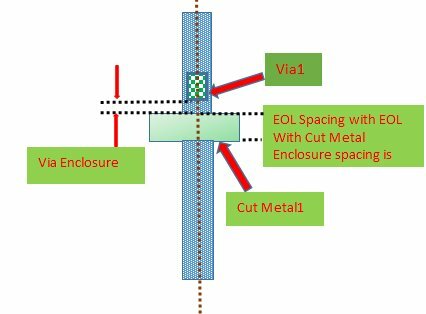 The Cut Metal is the new layer, which is introduced in order to minimize the EOL (End of Line) spacing, MAR (Min Area) violations, and Via Enclosure rule. Helps to maintain the shorter standard cell height (CM1A and CM1B) [Refer Fig c for a better understanding]. It helps to reduce the distance (Left and Right) between the two standard cells due to CM2 [Refer Fig c for a better understanding]. 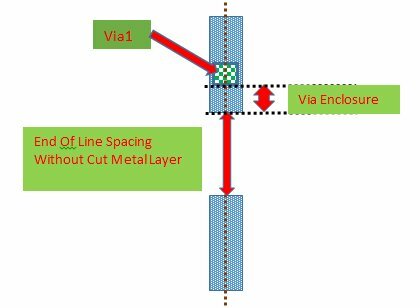 The Cut Metal helps for EOL (shrinking the end-to end-spacing) and MAR and Enclosure violations [Refer Figs a and Fig b]. Fig c: Depicts the shorter standard cell height due to usage of Cut Metal1, and aggregating of cells is possible due usage of Cut Metal2. 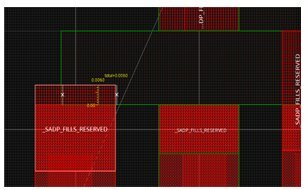 Here we discuss the techniques to fix the DRC violations seen in the 7nm ASIC Designs. Here, the trapezoid marker denotes the error prompted at vertical metal layer (M1). 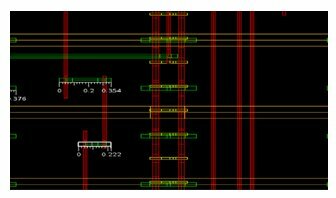 The error is due to the absence of minimum spacing between the metal track and the Cut Metal present between the two vias (VIA12). 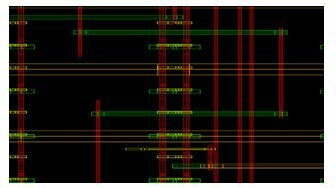 This DRC simply depicts the minimum area of the horizontal metal track four (M4) shown in green color, which is less than 0.015 microns2. To solve this, we have extended the horizontal metal layer four (M4) track. 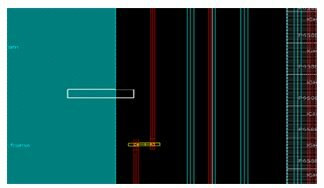 As shown in the figure, the re-routed track is taken from vertical metal layer three M3 in red to horizontal metal layer four (M4) in green. 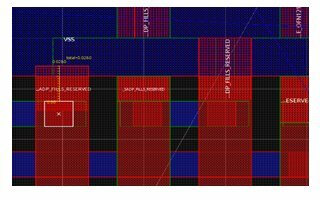 In here, DRC popped up due to the violation of minimum spacing between via of horizontal signal metal track layer two (M2) in yellow color with the via of the power tracks in the same layer. In the figure, the center mark is the signal track and at the corners of the triangle, there are two power tracks vias. This DRC was solved by re-routing the track away from the power vias. As shown in the figure, the highlighted tracks with zig-zag routing represent one of the possible solutions to eliminate this DRC. 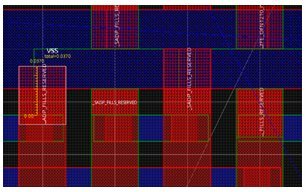 The Cut Metal vertical layer three (M3) in red violates the minimum the spacing with the internal layer of the memory IP shown in blue color. 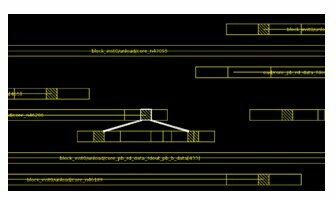 To solve this type, we re-routed the vertical metal layer three (M3) through horizontal metal layer two (M2) in yellow color. In order to fix the DRC, we can extend the patch to exceed the limit of 0.037u. The Cut Metal Overlap DRC is tagged with the name CM1B.O.*. It is due to the overlapping of CutMetalM1 of Mask 2 or (Mask B) and the M1 of Mask 1 or (Mask A). 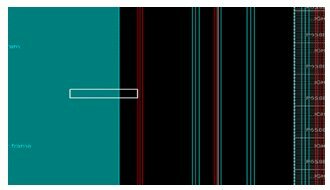 The vertical overlap between M1(MaskA) and CM1(MaskB) in this case is 0.008u. Just by extending the Patch by length greater than >=0.0150u, the DRC can be fixed. As in above figure, the Cut Metal for Mask 2 Layer M2 is present between two nets: netA and netB. Cut Metal2 is giving spacing violation with NetC and NetD of Metal2. By rerouting the small portion of NetC and NetD this Cut Metal spacing DRC can be solved. The successful tapeout of ASIC chips requires the DRC rules to be met for the better DFM yields. By using the methods explained in this paper, the different DRC violations related to the technology node 7nm can be addressed. 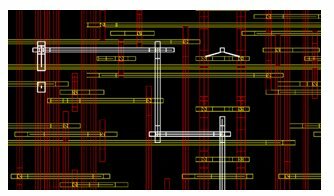 Some of the practical approaches we discussed in the paper can help in early closure of the design, and also help to reduce the number of iterations required at the sign-off stage. The end result is faster tapeout of the ASIC. Jayesh Prajapati is working as an ASIC Sr. Physical Design Engineer at eInfochips (An Arrow Company). He has more than 4.5 years of experience in ASIC Physical Design. He has experience in the bock level implementation at lower node (7nm and 16nm) technology for ASIC chip, where his accountabilities include the Block level APR, and complete Sign-off closure for the same. He has handled multiple complex blocks in terms of Memories and instance count in the design. Swati Chavan has over 4.3 years of experience in ASIC and has worked as an ASIC Sr. Physical Design Engineer at eInfochips (An Arrow Company). She has experience at the bock level implementation in lower node (7nm and 16nm) technology for the ASIC chip, where her accountabilities include the Block level APR, and complete Sign-off closure for the same. Akash Verma is working as an ASIC Physical Design engineer for the company, eInfochips (An Arrow Company). He has pursued his Bachelors in Engineering from Gandhinagar Institute of Technology, Gandhinagar. Presently, he is engaged in Block Level Implementation for a Networking ASIC chip at 7nm FinFET technology, where his accountabilities include the Block level APR, and complete Sign-off closure for the same. He is really enthusiastic about the Analog Mixed Signal designs and has keen info on EDA tool’s algorithmic flow and methodologies.